The Best Time to Visit Cambodia - A Guide from Holidayguru.ie! Cambodia is located in Southeast Asia and it borders Laos, Thailand, Vietnam and the Gulf of Thailand. Phnom Penh is the capital of Cambodia, located in the south of the country. A trip to this hugely developing economy will bring you cultural treasures as well as beautiful islands and scenic beaches. Here you can combine sightseeing tours with a beach holiday. Here in this article can find out all you need to know about the best travel time to visit Cambodia. The temperatures in Cambodia are always high and summery, but a few of the months are better for a trip than others. I’ll tell you about the dry season and rainy season, and you can use a climate chart to see the weather conditions in each month. If you want to travel the country in Southeast Asia for the perfect weather conditions, I recommend the months of November to February as the best time to visit Cambodia. Although high temperatures allow for year-round travel, all other values ​​aren’t the best outside this time period. In November, December, January and February there are ideal temperatures that are not too high. December and January are the coolest months with a temperature of about 26 degrees Celsius. As a rule, however, the thermometer also reaches the 30 degree mark in these months. In March, the highest daily values ​​are around 34 degrees Celsius. However due to the low humidity, which is less than 50%, experienced Europeans can stand the high temperatures. From April, it will be really hot and quickly reached the 40 degrees Celsius mark. Despite low humidity, I would still advise you to take a holiday in April and May. Those who are not used to such high temperatures are tormented and the holiday itself brings little to no recovery. During the best time to visit Cambodia, it also stays warm at night and the temperatures are not very cold. At night you can count on it being around 21 to 23 degrees Celsius. Air conditioning in the hotel and a short pajamas are useful in the warm nights. Another important feature of the best time to visit Cambodia are the rainy days. If you travel in November, December, January, February or March, you can be sure that your holiday is by no means dominated by rainy days. It rains a maximum of 1 to 7 days during these months. January, February and March are considered the driest months, it usually rains monthly in one day. However you must not: These values ​​are indicative, there is no guarantee. 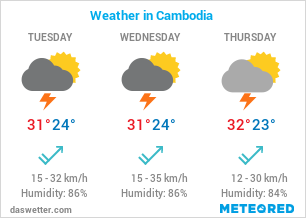 The weather in Cambodia can be unpredictable. In the rainy season even more than in the dry season. Another important value for the best travel time is the number of hours of sunshine . From November to March the sun shines daily between 7 and 9 hours. Ideal for lounging on the beach and for sightseeing tours. Speaking of the beach: the water temperature of the Gulf of Thailand is warm throughout the year, so you can jump into the sea after a long session of sunbathing.. The most important attraction on your Cambodia holidays is Angkor Wat. The temple complex is the country’s landmark and a must on sightseeing tours. No matter where you are in Cambodia, you have to check out Angkor Wat. The huge facility is located in Angkor, a region 240 kilometers away from Phnom Penh and near Siem Reap. The large lake Tonle Sap is about 20 kilometers away. The best time to visit Angkor Wat is consistent with the best travel time for all of Cambodia. From November to February the best weather conditions prevail at the temple complex. The sun is shining, the temperatures are high, but the low humidity helps you to better cope with the temperatures of 30 degrees Celsius and more. But the ideal travel time is also the high season in Cambodia . That means there are many other tourists on site. A little insider tip is the summer as the best travel time for Angkor Wat. Due to the increased precipitation, the vegetation is lush and the surrounding rainforest shines in full bloom. In addition, the pools and artificial lakes are filled with water. In the winter months this is not the case, as it rains much less often. If you travel to Cambodia in the off-season between April and October, there are fewer tourists at the temple complex and you can enjoy more peace and quiet while sightseeing..
As Cambodia borders, among other places, Thailand and Vietnam, a visit to these countries is worthwhile on a trip to Cambodia. All three countries are located in similar climates, so that similar travel times for Cambodia , Thailand and Vietnam arise. The best travel times of each country overlap, so there are several months, in which it is the best travel time for a round trip through these three countries. In the table below I have listed the best travel time for Cambodia, Thailand and Vietnam . The bold months show you the best travel time for a round trip, where you can expect the best weather in each country..
Cambodia has a tropical, humid climate that is noticeable throughout the year. Due to the proximity to the equator it is always warm to hot in Cambodia. Temperatures below 30 degrees Celsius are rare and usually occur in December and January. These are the coldest months of the year. April is considered the hottest month, with temperatures regularly reaching 40 degrees Celsius. The country consists of a vast plains, the Cambodian basin, which surround mountains and plateaus. Regionally, there are no significant differences in climate. The maximum temperature difference between north and south of the country is 1 to 2 degrees Celsius. Daytime temperatures in the lowlands are around 30 degrees Celsius a day, but it can be fresher in the higher altitudes..
Like most countries in Southeast Asia, Cambodia is also under the influence of the monsoon. The year is divided into a dry and rainy season. Below I will show you the characteristics of these two seasons. The dry season in Cambodia is without a doubt the most popular travel time for holidaymakers. The best weather conditions of the year prevail during the dry season. From November to mid-May , the northeast monsoon brings cool and dry air. Cool here means that the temperatures are not quite as high as in the Cambodian summer, but it is still hot. In particular, the months of March, April and May stand out once again from the winter months. They count towards the heat during the dry seasonwhich can lower the circulation with temperatures up to 40 degrees Celsius. November, December, January and February score 30 to 32 degrees Celsius a day and 21 to 23 degrees Celsius at night. The dry season gets its name due to the low rainfall. Rain falls on 1 day of the month in January, February and March. This is not worth mentioning compared to months of the rainy season. A low humidity, below 50%, favors the high temperatures and it feels less oppressive and humid. There are also 7 to 9 hours of sunshine a day during the dry season. In May, the monsoon change begins and the rainy season begins. In June the rainy season is in Cambodia is in full swing. The reason for this is the southwest monsoon, which brings rain from the sea into the country. October is the wettest months of the year. On average, it rains in 16 days this month. Fortunately, the rainy season ends with October. In all other months of the rainy season – June to September – it rains around 10 to 15 days. Usually the rain comes at this time in the afternoon or in the evening and night hours. Tonle Sap, the country’s largest lake to the west, is lucky. It rains the least here. Nevertheless, the lake grows enormously in the rainy season. Due to the large volumes of water, the Mekong, one of the 12 largest rivers in the world, grows significantly. As a result, the Tonle Sap River changes direction and the lake fills up. In the rest of the lowlands around the Tonle Sap there is minimal rainfall. In the higher elevations, especially on the western mountain slopes, it is raining increasingly, but the elephant mountains have the most precipitation. The most unpleasant feature of the rainy season is the extreme humidity. At over 90% humidity and temperatures of up to 35 degrees permanent sweating is inevitable. If you want to see the beautiful landscape of Cambodia with all its historic temples, the rainforests and the many other highlights, you should check it out in the dry season. Therefore, the months of November , December , January , February are the best for first timers. For experienced travelers to Asia, March is the best time to go to Cambodia. It is warm, but due to the low humidity, you don’t have to be sweating all the time. The sun shines for many hours a day and rain falls only rarely. Whether for sightseeing tours or a beach holiday on a beautiful beach: theres no doubt that from November to February / March you can enjoy the country with all its beauty. The rainy season can be a good time too due to favorable hotel prices and less tourists. However, increased rainfall can ruin your holiday. Also, because heavy rains make many roads impassable in Cambodia. Under a blue sky and with bright sunshine, a Cambodia vacation is so much more fun!